Just as riding a motorcycle requires a different set of skills and practices than driving a car, so does purchasing one. And buying a used bike is even more complex than purchasing a new one. Here are some tips that will make purchasing a previously-owned ride a bit easier. If you’re a first-time motorcycle buyer wondering what kind of bike you should buy, articles like these on The Manual and RevZilla can help narrow your choices. Cycle World offers a buyer’s guide to find the right make and model. Useful resources to research prices are Kelley Blue Book, NADA Guides, Cycle Trader, or Motorcycles on Autotrader. You may also want to contact your insurance company to find out if/how much the purchase will affect your rates, especially if this is your first bike. When buying a used motorcycle, you have a choice: do you want to purchase from a licensed dealer, or from a bike owner? Both have benefits and drawbacks. When you purchase from a licensed dealer, they have already done a lot of the work. They’ve investigated the bike’s history and ownership, and checked that it is roadworthy and safe to drive. First-time buyers may want to go this route, but be aware that you may pay a bit more. Purchasing from an owner may be more affordable, but unless you are knowledgeable about motorcycle mechanics, you may be taken for a ride. Consider bringing along a cycle-savvy friend, or, ask if you can have the bike looked over by a trusted mechanic to ensure it’s safe and worth the asking price. Remember that buying from an individual owner means dealing with a person who may have an emotional attachment to the vehicle, so you may need a bit more finesse than you would with a dealer. Above all, be respectful. If you can’t afford the asking price, be honest. Don’t suggest the bike isn’t worth the money. The owner may be willing to negotiate with a good faith buyer, but not one who insults his ride. This is especially important if purchasing from an owner or individual. Before entering into negotiations, be sure the seller has a clear title in hand, and that the registration tags are current. If you’re buying from a dealer, ask for a vehicle history report. If not, you can get one yourself from CycleVin or InstaVin. Check that the Vehicle Identification Number (VIN) on the title matches the numbers on the bike, and that the VIN on the bike don’t appear to be re-stamped or altered. Other paperwork to ask about: Did the owner keep maintenance records? Many don’t, but if they did, it’s a good sign. Is there any warranty associated with the vehicle? Was the bike well-cared for? Look for paint scratches, dents, missing trim, rust, tears or missing foam in the seat, and windshield cracks or improper mount. Mileage: High mileage is not a deal breaker if the bike was well maintained, but be aware of how mileage compares with similar bikes. Drive chain and sprocket: Have someone with a similar build to you sit on the bike while you examine the chain. It should be well-lubricated have a bit of play (about ¾”). Check sprocket teeth for over wear. Handlebars should be straight, grips and mirrors in place and in good condition. Check that hoses and cables are all secured and in good condition. Check the tire wear and “hero blobs” – the metal indicators on the foot pegs for hard wear. Check wheels for dents. The spokes should all be snug and tight. Check brake pads for wear. Forks should be straight and scratch free; make sure the seals are not cracked, worn or leaky. Lift the seat and look at the engine: are the factory connectors still in place, or do you see electrical tape or odd wiring? Check the fuel tank for rust or corrosion. Check the battery with the engine off. The voltage should be no less than 12v when the engine is cold. Check for corrosion of fuses. Fluids – does the oil or brake fluid look dark? Are there any indications of crash damage that has been repaired? Replaced parts, repainted or buffed out areas, welds or deep scrapes indicates the bike may have been damaged. Before you look at the bike, ask the seller to leave the motor off until you arrive so you can see how it starts up. Does it sputter, or make abnormal noises at first? This might indicate a problem. Once you’ve started it, check the battery voltage again. It should be no more than 14v running. Check that the headlights, brake lights and signal lights are all working properly. Accelerate through the gears and listen for engine noises. Transmission should be smooth as you change gears. Listen for a creaking or rattling suspension. Does the clutch drag or slip? Is steering stable and easy to correct? Does the bike emit any smoke? After you’ve ridden it, park it and give it another once-over to check for leaking fluids. If the bike didn’t pass all of these inspection points, you may want to rethink the purchase. 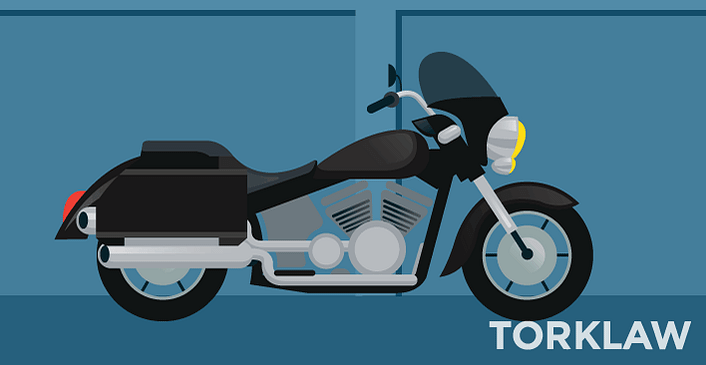 If you’ve done the work, your used motorcycle purchase should be a smooth ride. But even the most experienced riders can have an accident. If you are injured in a motorcycle crash, call motorcycle accident lawyers at TorkLaw for a free, no-obligation consultation: (888) 845-9696.